This is one of those cases when I have talked to myself and told myself that, once again, it is not the best idea to tackle a subject about which you know very little. I was always vaguely familiar with the name of Don Stumpf, having followed stock car racing as much as I could throughout my childhood and youth. I remember even lecturing a fellow college student student named Stumpf how he had the same name as an outstanding stock car driver. Even though he came from the same general region, he was not all that interested. 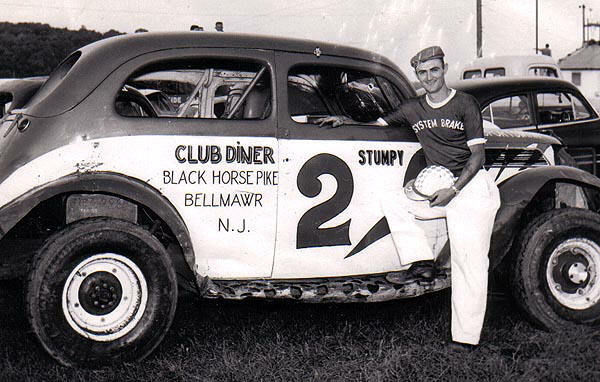 Stumpy, shown as an East Windsor Speedway driver, around 1964. I think the photo was much earlier, as he had a newer helmet in some '50's shots. Well, the name kind of settled into the back of my mind for years until I read the book on the history of Fonda Speedway, by Andy Fusco, Lew Boyd, and Jim Rigney. Their account of the huge Jerry Jerome / Don Wayman crash and the unconscious role Stumpf played in that brought him back to the forefront for me. However, we are not exactly swimming in information on Don Stumpf, the way we are in someone like Richie Evans or Bill Wimble. So, here goes an attempt to just give the guy a little ink while warning the reading public that I don't know much about the guy. Don Stumpf definitely saw the best part of his racing career unfold in the 1950's. 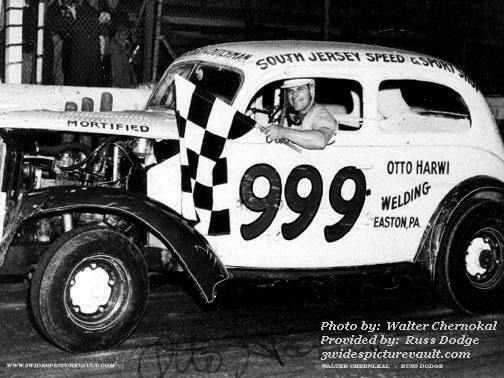 A very big name in New Jersey racing at places like Alcyon Speedway, Wall Stadium, and Old Bridge Speedway, the man nicknamed Stumpy was apparently very versatile, choosing to run on the dirt at places like Old Bridge one time and on the pavement such as at Wall other times. sedan, or after in the Stumpf career. As early as 1952, he was already in enough promience and at a high enough skill level to not only make the Langhorne rae, but to finish – in 25th. Early on when it was fashionable to stage midget races in indoor venues such as the Kingsbridge Armory, Don ran a midget for John Wherle at the Teaneck, Nj Armory. This may have been in addition to stock cars, during the stock car offseason, or along with running stock cars – it isn't clear. Stumpf appears to have been very loyal to the NASCAR sportsman division, often running among the more powerful modifieds. He ran against the likes of Jack Hart, Lou Mood, Nick Nicholette, Vince Conrad and Wes Pultz. 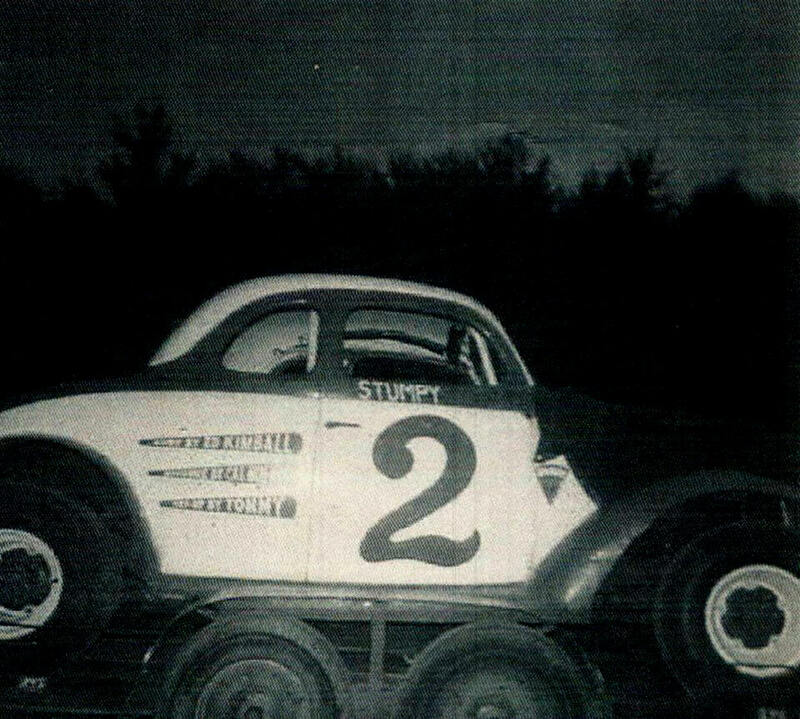 In a racing world where the “big boys” [modifieds] were populated by the likes of Bill Chevalier, Wally Dallenbach. Sr., Al Tasnady, Budd Olsen, Otto Harwi, Jackie McLaughlin, and the like , the racing – rich area of New Jersey / Pennsylvania/ Southeastern New York was a tough row for anyone to hoe. For a particular period of time, New Jersey tracks were even attracting regular participants from Delaware, the Washinton D.C. Area, and Baltimore. Don Stumpf had to contend with a number of legendary drivers in his region and era. Otto Harwi [above] and Jackie McLaughlin were two of these. While running at a number of tracks that – at one point or another – included East Windsor, Alcyon, Vineland, Flemington, Old Bridge, and Wall – Stumpf seemed to finally concentrate on the paved tracks by the end of the 1950's. At first, he had concentrated on Flemington and on the very irregularly – shaped Alcyon track in Pittman, NJ.. 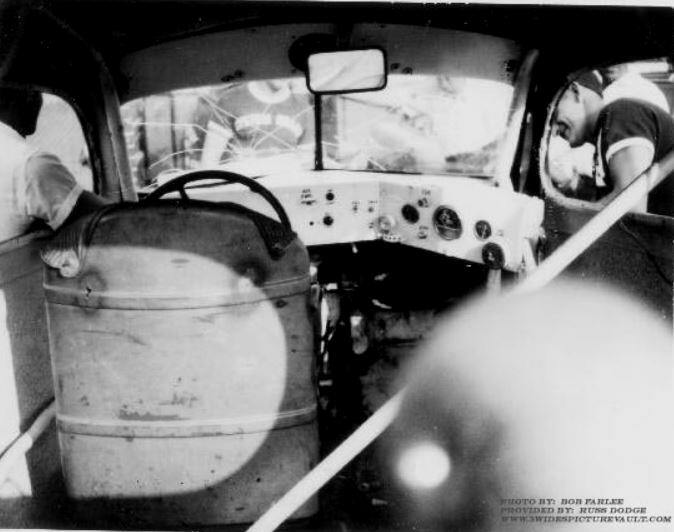 The serious driver, even in the 1950's could run almost as many times a week as he felt he could manage. Alcyon, alone, ran twice a week. In 1956, running at places like Wall Stadium and Alcyon, Stumpf was having a banner year and began aggressively seeking NASCAR points. In July of that year, he found himself rained out at Wall and sought to go north to find a NASCAR track at which to run and get those badly – needed points. He ended up, somehow, all the way up to Fonda [which, by that time, was only in its third year of operation]. Little did anyone know then, but the irregular fairgrounds horse track turned out to be a very good setup for pavement cars. time period. 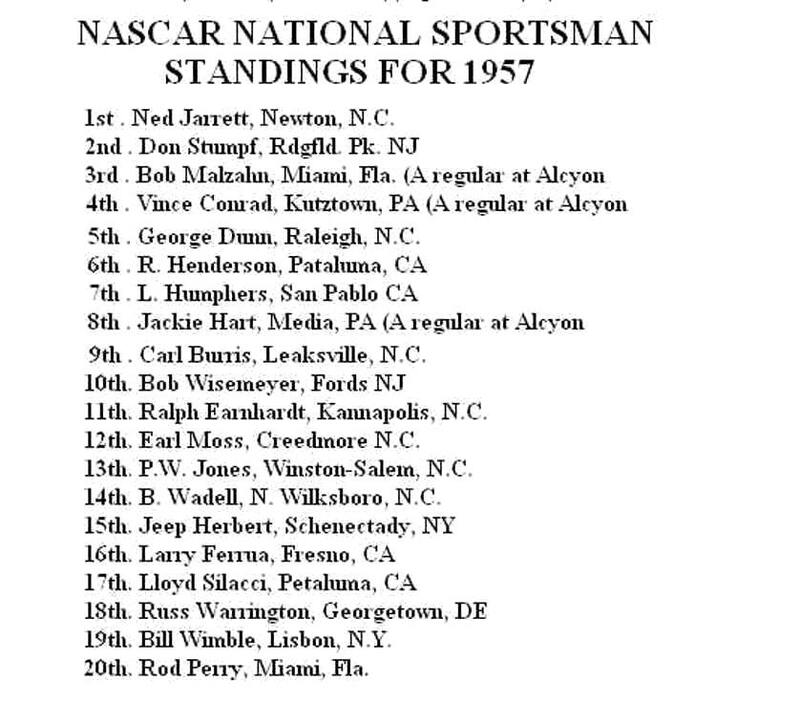 Below – The 1957 NASCAR Sportsman points finish. Stumpf pulled in with his impressive hauler, painted up to match the car. 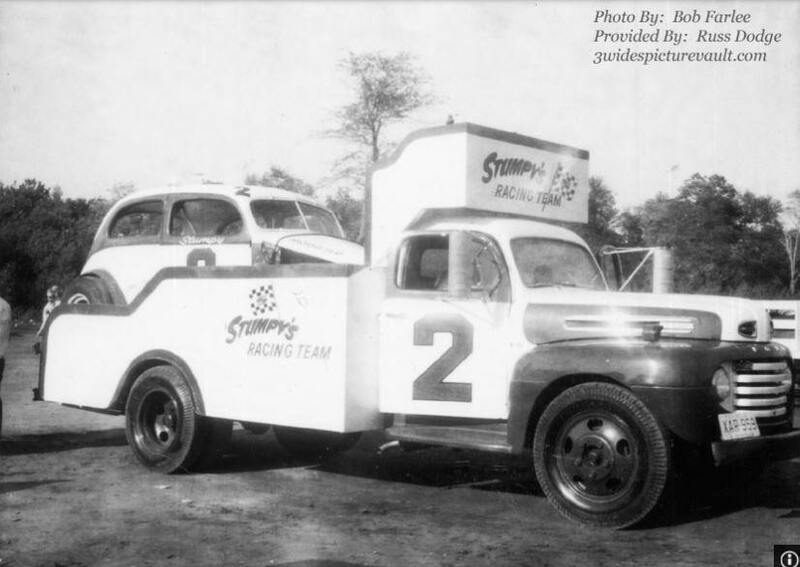 Many of the local teams had matching pickups that would pull the car on a trailer, while Stumpy's was a single unit hauler, more like most people would have in later years. The rear deck, while not slanted as haulers would be later, was enclosed by high sides that partly hid the white sedan. The sides were emblazoned with “Stumpy's Racing Team”. That night, starting in the rear of the feature field, Stumpf gradually wended his way all the way up through to take the win – a major upset. 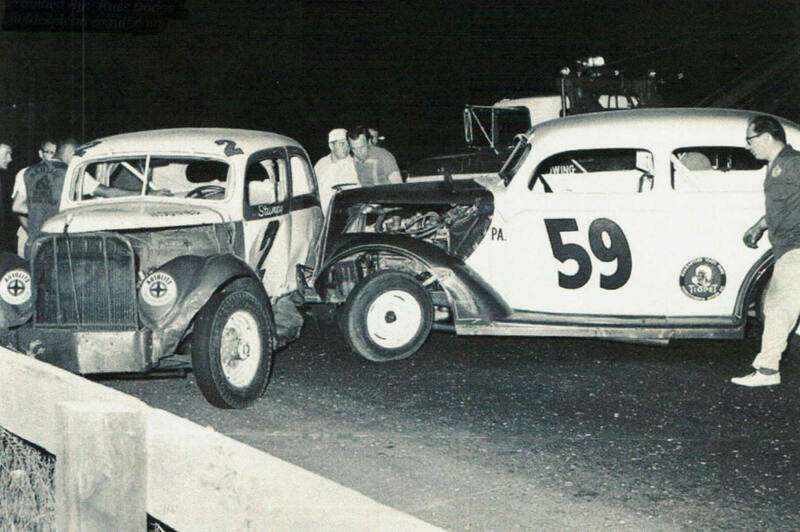 Few, if any, outsiders won when they came to the Montgomery County fairgrounds track. For years, only about four men ever accomplished this. The legendary Steve Danish wummed it up by mentioning that – before the Stumpf win – the groove of choice at Fonda in the middle. After, it was the inside. Stumpf, posing for a picture at Fonda probably before the win. Below – The cutting – edge Stumpf car hauler. Fonda has – over the years of the old coupes – shown a tendency to favor the pavement setup. Witness not only the Stumpf win, but also the tremendous success of Rene Charland and the Czepiel 888's, asphalt cars built by Fred Rosner. Dave Lape had good success with Rosner cars, as well. 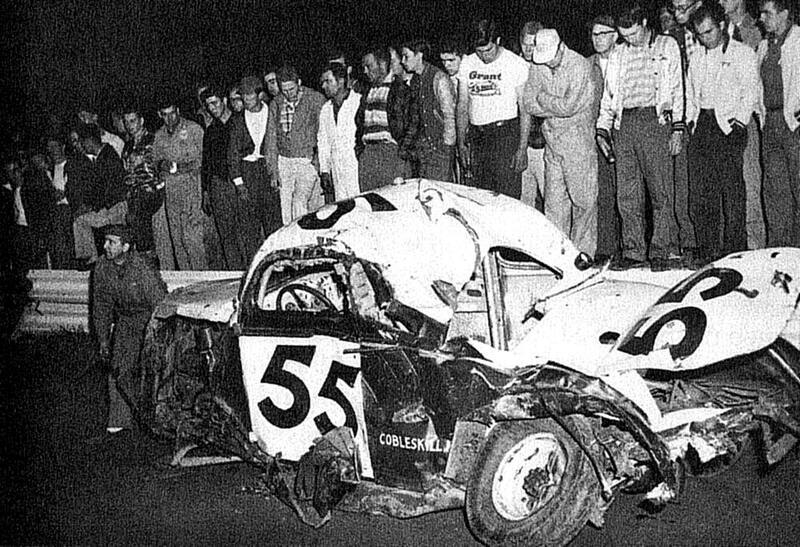 Even Jim Hoyt, of Saranac Lake, who may have had the most spectacular crash in the history of the track [had the Fonda book been able to find any photo of it] was flying the night he wrecked his red 55. The car had been set up by Oswego star Eddie Bellinger, Sr. So, after the 1956 win, Don Stumpf always had an itch to return to Fonda for more easy pickings. Fonda regulars, while not exactly slouches, were reknowned for their resentment of invaders [especially successful invaders]. 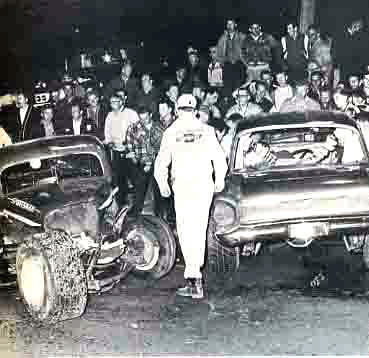 So, when Stumpf pulled back into the track in the Fall of 1958, no one was all that glad to see him. According to local lore, Stumpf was overheard to say that Jerry Jerome's flathead – powered #550Jr, would be one car he [Stumpf] wouldn't have to worry about. Jerry Jerome sits, dazed, on what's left of his flathead 550Jr. He has likely forgotten Stumpf about now. Below - Officials walk among the remains of the Jim Hoyt wreck, which occurred around 6 years after the Jerome wreck. Incensed, Jerome made the statement that, if it was last time he ever raced, he was going to beat that cocky NJ S.O. B ! [And it almost WAS the last time he ever raced]. As two years before, Stumpf was making his way to the front. Jerome, definitely underpowered among the overhead V-8's, was driving his heart out, passing cars left and right. According to the popular version, Jerome had worked up to a few cars behind Stumpf's #2 sedan when he encountered the 55A of Don Wayman. Jerome went by Wayman, who then dove under the 550Jr and the two touched. Both cars launched int oa series of barrel rolls and flips that also involved the Herb Roots – owned H2, then driven by Doc Blanchard. Don Wayman's car. After the Jerome wreck. He was revived; the car ? Not so much. Below – Herb Roots' H2, the former 271. Doc Blanchard was injurted in the Jerome/Wayman wreck. The Jerome car lay on its side, components all over the front stretch; the H2 sat by the wall, mortally wounded; and Wayman hung out of the window of his car, temporarily unconscious. Stumpf, sitting under the red flag rule somewhere away from the carnage, was totally unaware of his imvolvemnt in this sbafu. The H2 returned in future seasons with young Skip Roots driving; Wayman went on to decades of driving for other owners; but Jerry Jerome never again was a player on the Fonda scene. 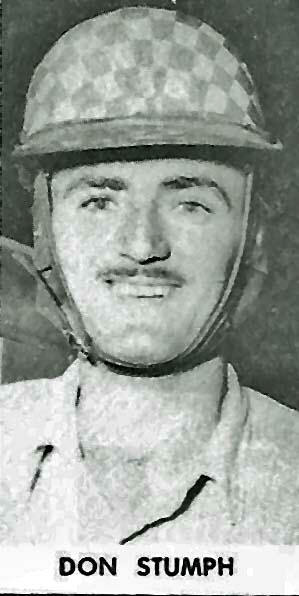 Don also won the Alcyon sportsman title in 1956. 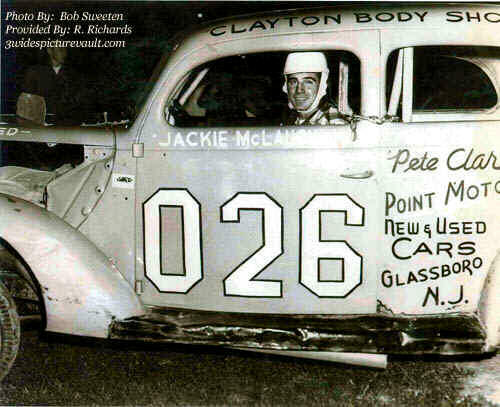 The following season, he raced often enough and well enough to finish second to Ned Jarrett in the NASCAR National Sportsman championship points – a considerable feat given that the class had not yet reached the point where Northeasterners were dominating it like they did in the 1960's. Vince Conrad, Jack Hart, and Bob Malzahn also finished in the top ten that year. luck somewhere in New Jersey. 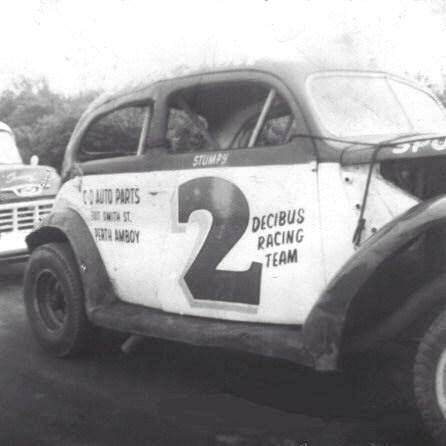 Don Stumpf rapidily acquired a reputation as a driver who could race effectively on both paved and dirt tracks. He was a consistent qualifier for the big, important race at season's end at Langhorne, PA. Somewhere along the way, he would participate in one NASCAR Grand National race somewhere in New Jersey. He would run at Langhorne for years to come. He ran into the early 1960's before deciding to hang up the helmet. He would have been an ideal member of some All Star League team, but he idea came a little too late in his career for that [much like Steve Danish]. 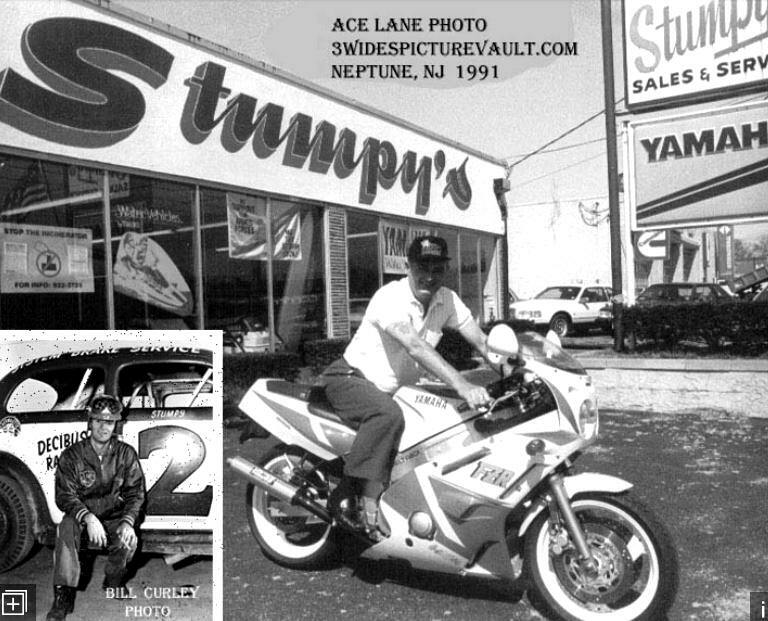 Stumpf opened a motorcycle dealership, appropriately called “Stumpy's” in Neptune, NJ. I am certain, with his numerous accomplishments, that he must be in a few local halls of fame. For years after his retirement, he was happy to talk to people about his career. Other than around the Fonda of the 1950's, it is hard to find people with bad things to say about the man called “Stumpy”.